1. log in to your BrainMD Health Account begin by clicking the "My BrainMD" drop down menu item in the upper right hand side of your screen. Then click on the "My Account" link in the drop down menu. You can also click here to get to the account login page. You can also click here to get to the account login page. 2. 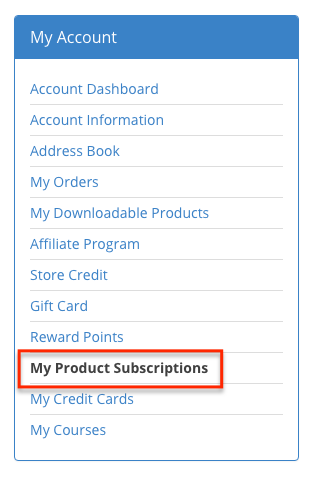 Once you are logged in to your account dashboard click on the " My Product Subscriptions" tab in the left hand navigation. 3. For each product subscription you wish to change the next shipping date for, use the " Next Ship Date" field and/or calendar icon to choose your next shipping date. 4. For each product subscription you wish to skip the current month's pending shipment simply click on the " Skip Next Delivery" button. Your subscription product will now ship on the same date the following month.